Kind and accommodating at front desk, clean room, breakfast was good. Where to find Addison hotels near an airport? Where can I find hotels in Addison that are near tourist attractions? There are no Expedia accommodation options in Addison itself, so an easy option is to book one of the 13 lodgings that are less than 0.1 kilometres (0.06 miles) away. 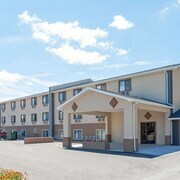 The Staybridge Suites Corning, New York, which is the closest accommodation, is located 20 kilometres (13 miles) from downtown Addison. As an alternative, investigate the Fairfield Inn Marriott Corning, located in New York, which is 19 kilometres (12 miles) away. 20 kilometres (13 miles) from the main part of Addison, is the Radisson Hotel Corning. Alternatively, the Comfort Inn Corning is positioned 20 kilometres (12 miles) away. 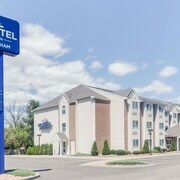 Other Expedia-registered hotels are the Holiday Inn Express Painted Post-Corning Area and the Ramada Painted Post Corning. Once you have got to know Addison, why not go a bit further afield? The Finger Lakes Region district has plenty of attractions. Finger Lakes Region has lakes, and commonly visited Finger Lakes Region attractions include craft workshops and open-air markets. Fun-loving travelers might also try cross-country skiing, hiking and picnicking in this part of United States of America. The nearest accommodation options in Elmira include Horseheads and Painted Post. Horseheads is 40 kilometres (25 miles) to the east of Addison, while Painted Post is 18 kilometres (11 miles) to the northeast. 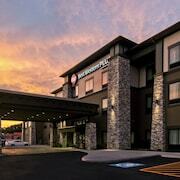 Hotels in Horseheads are the Holiday Inn Express Elmira - Horseheads and Hampton Inn Elmira-Horseheads. 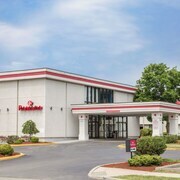 While apartments and hotels are the Econo Lodge Painted Post - Corning and Americas Best Value Inn. Before you head home from Elmira, ensure you catch some local sport. Visit Canandaigua Motorsports Park to the north of Addison. 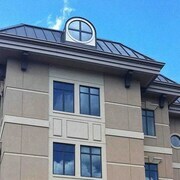 Stay right near the action at the Holiday Inn Express Canandaigua - Finger Lakes or the Campus Gate. Elmira - Corning Regional Airport is a logical airport for flying in and out of Addison. It is 35 kilometres (21 miles) away. If you plan to stay nearby, try the Hilton Garden Inn Elmira/Corning or Country Inn & Suites By Carlson Big Flats (Elmira). What are the most popular Addison hotels? Are there hotels in other cities near Addison? What other types of accommodations are available in Addison? Explore Addison with Expedia.ca’s Travel Guides to find the best flights, cars, holiday packages and more!